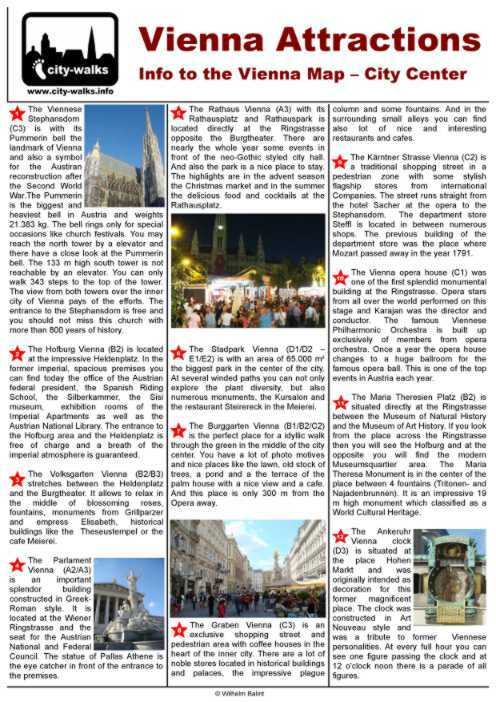 Please click on the picture of the Vienna Attractions Sheet to open the PDF file! Here you get a structured info about the most popular attractions in the city center of Vienna. In this listing you will find some historically buildings, beautiful parks and gardens, shopping streets and the nicest places of the city. With one sheet you will get a compact overview of the city-walks online information about the sightseeing attractions in the city center. At the beginning of every description you can find the coordinates to the city map for an easy orientation. Together with the Vienna map of the city center and this sheet you have the most important information for an extensive sightseeing tour through the center of Vienna and you are able to look for the most important information about the different stations at any time. Just make a print out of the different downloadable PDF sheets and take it along at your sightseeing tour.